^ Archived copy (PDF). [11 July 2011]. （原始内容 (PDF)存档于28 September 2011）. 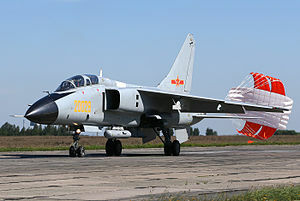 ^ British and Russian Technology for the Xian JH-7A FLOUNDER. U.S.-China Economic and Security review commission. [2007-04-06]. （原始内容存档于2007-04-29）. ^ 殲轟-7A攻擊機“重點型號”. AirForceWorld.com. [15 Aug 2011]. （原始内容存档于2010-10-18）. ^ “和平使命-2013”開幕 中方部隊開始跨國投送. [2016-05-18]. （原始内容存档于2017-03-05）. ^ 中国歼轰-7B亮相 将成神盾艦防空噩梦(图). [2013-12-24]. （原始内容存档于2013-12-24）. ^ 中国国际通用航空大会：一架飞豹战机出现意外坠机. 新华社. 2011-10-14 [2011-10-14]. （原始内容存档于2011-10-16） （中文（简体）‎）. ^ 海军一架飞机在夜间训练中失事坠毁. 新华网. 2014-06-06 [2014-06-06]. （原始内容存档于2014-06-11） （中文（简体）‎）. ^ 海军坠机事件2名飞行员牺牲 后座为少校领航长. 腾讯新闻. [2014-06-13]. （原始内容存档于2014-12-22）. ^ 中国空军三代战机数量已超欧洲总和 完全碾压日韩. [2017-06-17]. （原始内容存档于2017-06-20）.